Walk along a busy road, and you are likely to get a lungful of exhaust. However, you are probably breathing cleaner air than people in the cars passing by you. For decades, research has focused on the air quality outside of vehicles. Researchers are now realizing the air inside our cars can be far worse – as much as fifteen times worse than the air just a few meters away. The air inside cars can be 15x worse than just a few meters away. Why is the air inside a car worse than outside? Pollutant levels are often higher inside because cars take in emissions from surrounding vehicles and recirculate them. Studies have found that as much as half of the pollutants inside cars come from the vehicles immediately ahead, especially if those vehicles are heavy polluters, such as diesel trucks. Pollutants enter the car cabin through air vents and other openings because vehicles are not built to be airtight. Pollutant levels are often higher inside because cars take in emissions from surrounding vehicles and recirculate them. Roadway concentrations of vehicle-related pollutants are typically several times higher than ambient (outdoor) concentrations. Levels of some pollutants and toxic compounds can be as much as ten times higher inside vehicles than alongside the road, and overall air quality can be fifteen times worse. Nitrogen dioxide (NO2) – Harsh-smelling gas that can cause breathing problems, lung irritation, and lowers resistance to respiratory infections. Ozone (O3) – Naturally occurring compound that helps block harmful UV light from the sun. However, at ground level, it is toxic. When vehicles emit nitrogen oxides (NO), sunlight acts on them to create ground-level ozone. Ozone is the primary component of smog and is a major lung irritant. Long-term exposure may cause asthma and can result in serious and permanent structural damage to the lungs. Carbon monoxide (CO) – Colorless, odorless, poisonous gas that causes short-term effects similar to oxygen deprivation, such as dizziness, fatigue, and confusion. Sulfur dioxide (SO2) – When this gas is inhaled, it can cause shortness of breath and chest pain. In the long term, it can cause acute respiratory illness and permanent changes to the lungs. Fine particles (PM2.5) – Particles ranging in diameter between 0.1 and 2.5 microns. For comparison, the diameter of a single human hair ranges from 17 to 181 microns. When inhaled, these particles can lodge in lung tissue, triggering respiratory illnesses such as asthma, bronchitis, and emphysema. PM2.5 exposure has been linked to increasing the potential for cardiovascular problems, such as arrhythmic heartbeats and heart attacks. PM2.5 represent about 9% of all airborne particles. Ultrafine particles (UFPs) – Particles smaller than 0.1 microns in diameter. About 90% of all airborne particles are this size. Not only are UFPs the most numerous of airborne particles, but they are also the most dangerous to your health. The tiny size of ultrafine particles enables them to be easily inhaled, deposited into the lungs and absorbed directly into the bloodstream. From there, they travel with your bloodstream to all vital organs, including your brain. It’s estimated that the 6% of our days we spend in our cars can result in more than half of our UFP exposure. Pollution inside cars stuck in heavy traffic is as much as 40 percent higher than when traffic is moving. A study published in the journal Environmental Science: Processes & Impacts found the level of pollution was seven times higher inside cars that were stuck in traffic if the windows were open, compared to the exposure of pedestrians standing at major intersections. Pollution inside cars stuck in heavy traffic can be 40% higher than when it’s moving. Use a high-powered in-car air purifier. The Atem Car combines IQAir’s patented HyperHEPA particle filtration technology (only HyperHEPA filters are proven to filter ultrafines) with the industry’s best gas-phase media for complete in-car air protection. The Atem Car is easily portable and highly versatile. Use it as your personal air purifier at home, at work, and when traveling – it’s small enough to easily fit in your carry-on bag! Keep a safe distance from vehicles ahead of you, especially diesel trucks. Try to use less congested roads with fewer traffic lights, even if they take a little longer. Try to avoid rush hour. Don’t rely on traditional in-car air filtration systems. They are not effective at removing ultrafine particulates, volatile organic compounds, carbon monoxide, or other pollutants. Also, they don’t filter air entering your car cabin through windows and door cracks. Avoid car air fresheners or deodorizers; they are full of harmful VOCs and make your air quality worse – not better. Keep your car interior clean. Pollutants in cars can combine with dust particles and be inhaled. However, avoid chemical cleaners. Use a microfiber rag instead. Our reliance on cars is likely to continue, but there is something that we can do to minimize our exposure to traffic pollutants. 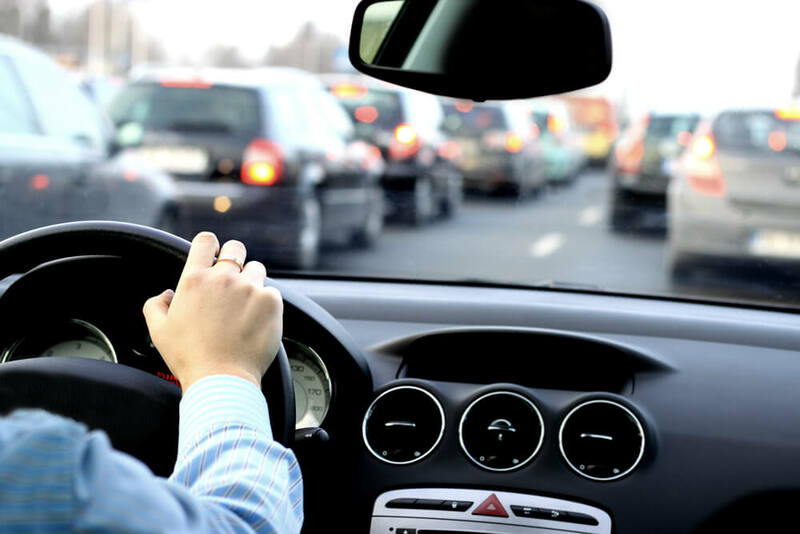 Following these easy steps can help you minimize your exposure in the car and thus, minimizing about 50% of your exposure to these dangerous airborne pollutants. Just turn on your Atem Car and breathe easily. Schrank D & Lomax T. (2007). Kumar P. & Goel A. (2016). Goel A. & Kumar P. (2015). Air Quality Life is brought to you by The IQAir Group, the world’s leading innovator of Indoor Air Quality solutions since 1963. This online publication is designed to educate and inform the public about the latest research and news affecting indoor and outdoor air quality.